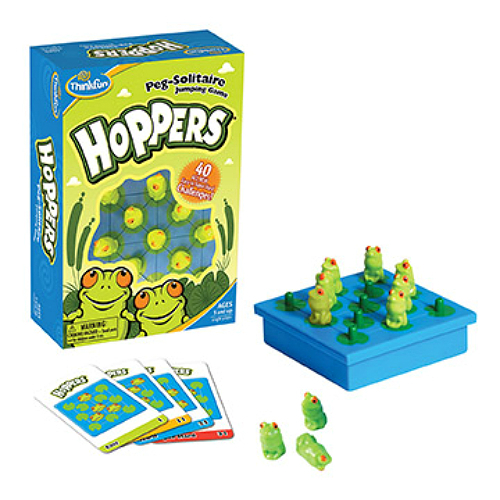 Hoppers is a classic peg solitaire jumping game which challenges you to leave one frog standing. Set the frogs on the pond according to your challenge card, then jump the frogs until only one is left standing. There are 40 challenge cards ranging from easy to super hard. Start simple and grow your skills with each level. In no time at all, you'll be the smartest frog in the pond! Once you start hopping, you won't be able to stop. 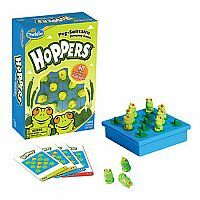 Includes: game grid with storage drawer, 40 challenges & solutions, and 12 Hopper Frogs. For 1 player. Measures approximately: 5.25 x 8.00 x 2.50 inches..